Photographer Carl Louis Gregory at the top of the undersea tube in the Bahamas, with J.E. Williamson and George M. Williamson (with camera) looking on. Thanhouser Career Synopsis: George M. Williamson, co-inventor of an undersea photographic device, appeared in a shark-fighting sequence in the opening scenes of a 1914 film released by Thanhouser, The Terrors of the Deep. He was also seen in Thirty Thousand Leagues Under the Sea. 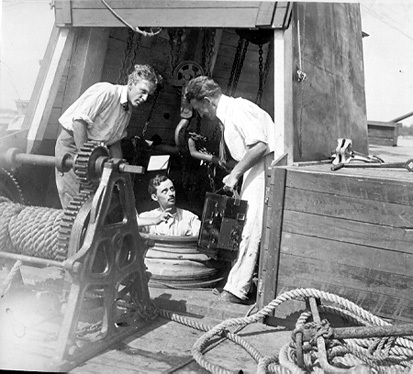 Biographical Notes: George M. Williamson and his brother, J. Ernest, sons of Captain Charles Williamson, achieved great recognition in the teen years for their undersea photographic apparatus. The Williamson brothers and their company, the Submarine Film Corporation (at one time known as the Williamson Submarine Film Corporation), were the subject of much Thanhouser publicity in 1914, arranged by Charles J. Hite, in connection with The Terrors of the Deep and Thirty Thousand Leagues Under the Sea, to which detailed listings refer. The New Rochelle Pioneer, October 10, 1914, carried this notice: "George M. Williamson, of the Submarine Film Corporation, Norfolk, Virginia, who invented the Williamson Operating Chamber with his brother, Ernest, has moved temporarily from 19 Rhodes Street to New York City because of the presentation of Thirty Leagues Under the Sea now showing at the Broadway Rose Gardens. He plans soon to start for the Bahama Islands to stage a big water feature this winter." After Charles J. Hite's death in August 1914, the Williamsons eventually made an arrangement with Universal, which distributed certain film footage under the title 20,000 Leagues Under the Sea. An article in The Moving Picture World, February 17, 1917, related that the Williamsons were going to make arrangements to make their own films. Earlier, various outside professionals, cameraman Carl Louis Gregory of Thanhouser for one, had been employed for various specialized tasks. George Williamson, secretary of the Submarine Film Corporation, stated that this would have certain financial advantages and would eliminate middlemen, commission brokers, buyers' agents, etc. "who add no value to the picture and create nothing in connection with it." The Submarine Film Corporation announced that May 17, 1917 would be the release date of The Submarine Eye, that November 1917 would see the release of Houdini's Sub-Sea Miracle, and that 1918 would bring additional sensations. However, by that time the novelty of undersea photography had faded and little more was heard of the firm. In May 1921 an article by Carl M. Gregory and J. Ernest Williamson, "Submarine Photography," appeared in the Journal of the Society of Motion Picture Engineers, and detailed the technical aspects of the Williamson device. George M. Williamson died at the age of 71 in Denver, Colorado on May 23, 1956, and was survived by his son, George, Jr., who lived in the same city. Note: George M. Williamson is listed in the present biographical section because he appeared as a subject in a Thanhouser film. It would be outside the scope of the present work to list all of the personnel associated with the Williamson brothers, for their company was not a part of the Thanhouser Film Corporation; their firm was associated with Thanhouser in a business venture.